Gee it really is amazing what having a near full nights sleep (on a regular ongoing basis) can do for you. C1 has been sleeping through (well apart from stirring at around 5am) since Christmas and this school year has been so much more productive. Not that we've actually turned out more work (although I do think we have somewhat) but just in the time we are spending together, the things we are doing together and my overall positive attitude, simply because I am not sleep deprived! I think we still have a ways to go before we are where I would like us to be but I am happy and content with our flow at the moment. We are home 3 - 4 days of the week, which is allowing us plenty of time to be together to do things. I am somewhat disappointed that we have only managed one Nature Walk/Outing so far this school year, which was the first week back. The second week I was sick and this week we had 2 play dates (more than I would prefer to schedule in a week but they were fun none the less), 1 of which was out of the house and the other was here at home. Our circle time/morning gathering has been going well, with quite a bit of singing, reading and general discussion, plus we have started to play a short game (either board or card depending on what I choose) during that time also. There's no way I could go through everything we read during that 1 hour each morning but I have included below a group shot of some of what we read this week. 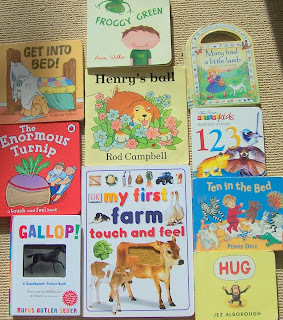 A few of our Tot School books from the week. This absolutely fabulous find was yet another charity store $1 buy (or was it $1.50, oh well does it really matter!) C is absolutely in love with this book. We sit and look at it and discuss all of the wonderful images at least 5 times a day if not more. He truly can't enough of it. The pages are very busy but he is enjoying that and loves finding new things on the pages each time we sit with the book. He had his first muffin tin lunch this week. Actually it was on Valentines day. I have been wanting to try adding these into our week for ages and just haven't gotten around to doing it. This was a spur of the moment decision so not very exciting, chips, ham, homemade trail mix, cucumber sticks, hommus and celery sticks. He did enjoy this and B and K were rather intrigued so I do need to get myself organised and start joining in with Muffin Tin Monday'. C continues to be a great little helper around the house. 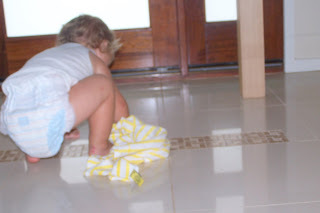 Water spillages are a disaster for him on our very shiny floors, he slips over nearly every single time, so I have been reminding him to grab a towel and clean up his spills. Oh and lets not forget the little lipstick adventure he had this week! He enjoyed a few firsts this week. His first time using Dot Markers, truth be told he was much happier running his fingers over the sponge tip and covering them in ink but he had fun none the less. Isn't it the experience that is more important than the end product anyway. This is something that I always try to remind myself of and one of the reasons why I keep things simple for him. I could have spent ages organising some kind of craft to use the dot markers with but he couldn't care less if we actually made something, he is just happy using the markers. We have plenty time to think about end products. We actually had a pretty decent storm one afternoon this week and lost power because of it. So I blew up a few balloons to play with. 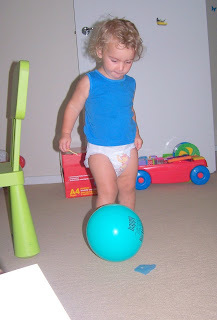 C decided that balloon soccer was the order of the day. 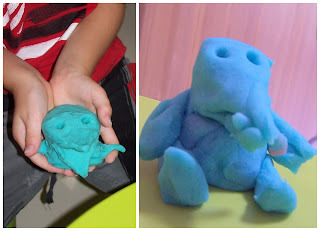 He also had his first playdough experience this week. I really felt that this would be one of those times where the set up and clean away is longer than actual experience, however I was wrong and very pleasantly surprised. He was extrememly focused on the playdough for well over half an hour. 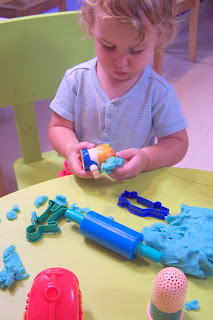 At first just pulling it into tiny little bits but he soon progressed to trying to push it into everything he could find in the playdough tub. This is little L2, C's cousin, he spent a nice couple of hours playing with everyone. 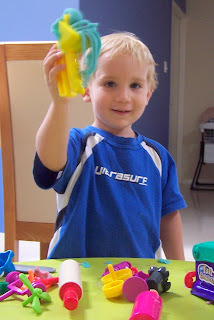 He ejoyed the playdough, C's Sensory Tub (he loved that alot) and also our Fisher Price Little People Play Sets. Whilst we played Hi Ho Cherry O, C got his own tub of cherries to play with. 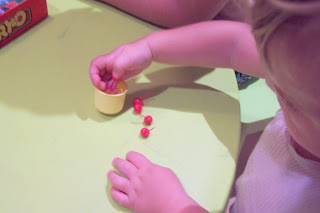 They are so tiny, taking them in out of the little pot was a fantastic fine motor activity and kept him entertained the entire time we played the game. This will be a fabulous first board game for him when he is at the beginning counting stage. 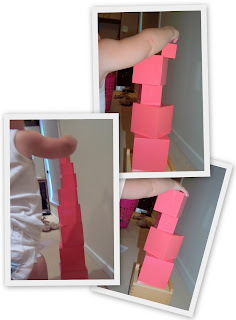 I introduced the Pink Tower to C this week. Certainly not planned, very much a spur of the minute decision. B & K were playing a game and he was interrupting them, it was right there next to us, so I grabbed it and showed him what to do with it. He had fun, was completely oblivious to his errors and actually thought that the whole thing was pretty funny. He did want to knock it over each time so I had stay near by to ensure that did not happen. I certainly don't mind the children creating their own extensions to the work but mistreating the materials I do not allow, even at 18 months. 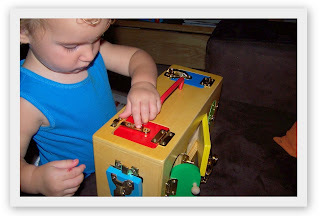 Another new activity from the shelves is this little lock box. I so love having a toddler in the house, everything is so new and exciting and they want to do and try everything, nothing is boring, nothing is not interesting at all. It is oh so refreshing.....please someone tell me how I keep that interest in everything alive!! That brings me to the end of C's Tot School and our last one for his 18 month, he turns 19 months next week. To see what other Tots have gotten up to this week visit 1+1+1=1. Ok ok I see a pattern happening, this is yet another charity store buy. I do love them, honestly I do. I have to admit I'm not big clothes and that sort of thing, I can't seem to get past the smell, but for books and games they are a treasure trove. 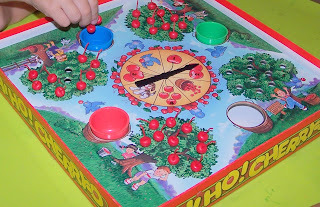 Browsing the other day I spotted Hi Ho Cherry O. I have never seen this game and had only heard about it so I really had no idea what it was all about. For $1.00 I grabbed it! What a great little game, definitely far too young for K as it practices counting up to 4 only but both of my kids enjoyed having a round or two this week. They even continued to play with each other whilst I did a bit of Tot School with C.
Lots of little cherries to take from the cherry baskets and place on the cherry tree, but watch out if you land on the spill your basket label you are right back where you started. First to fill their tree is the winner. This will be fabulous for C in in the future. 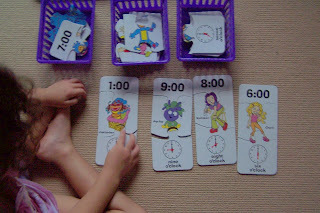 We spent a great deal of time this week talking about 'Time' concentrating on o'clock times. Brindle Bear Telling Time is, you guessed it, another charity store $1 find. It is actually nice little story. 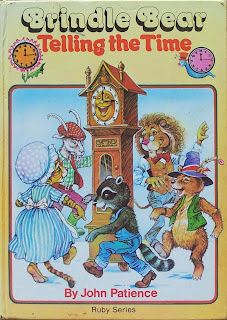 We have a few time books and really aren't stories at all but this one is and even has Brindle forgetting to do something he had agreed to do at a certain time because he was off having fun and not keeping an eye on the time. 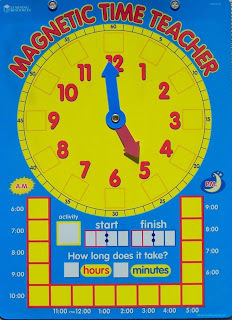 We used this Magnetic Time Teacher, but really just clock face. We did discuss analogue and digital times as we have both here in the house but focused more on analogue this week. 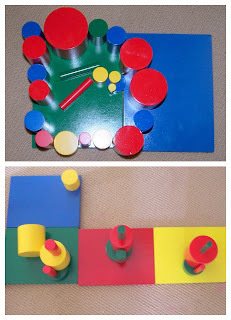 I have no Montessori Time Work at the moment so we had to use what I have on hand and even though it isn't perfect it still allowed us plenty of discussion on time. This Hi 5 3 part puzzles were ok, especially since they are also a charity store buy and cost me next to nothing. K had to match the analogue and digital times and then find the fun face in the centre. There are quite a few cards in this set and she did tire of it towards the end. We are also trying to get our days of the week down pat and have spent some time during our morning circle time talking about the days of the week. We've been singing this song from You Tube to help us along. I seem to have trouble embedding You Tube video's anyone got any pointers on that? In her Earlybird Preschool Maths the focus was on ordinal numbers this week. 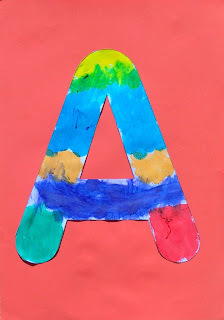 We did a small focus on the Letter A and the sort vowel sound. K did really well finding both the uppercase and lowercase A's in this story. She made this Dot Marker A to add to her alphabet scrapbook. I downloaded the letter template from here >>> K also did a handwriting sheet of lower and uppercase A's and I dug out my copy of Ordinary Parents Guide To Teaching Reading this week. I used this with B when he came home from school at around the same age as K so I am going to see how we go with that over the next few weeks. 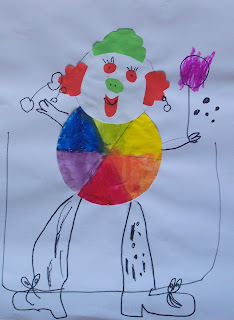 They still have a focus of colour in our home school network art classes and this week the junior class made Colour Wheel Clowns. So easy and oh so cute! 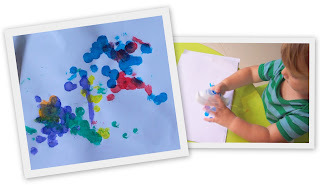 Make the colour wheel, discuss colours, warm - cool and colour mixing. Make a clown face with a few different cut outs of coloured paper. Glude them on and decorate. 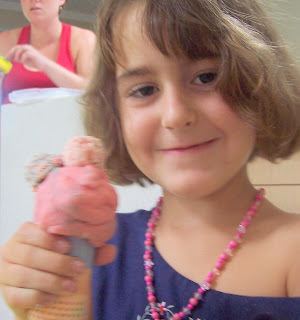 Give a girl some playdough and what will she make? An ice cream of course! We also did some painting on canvas this week, but I will post seperately about those. These paintings came after that when we had paint left over. Watched a couple of Magic School bus DVD's, Dinosaurs & Reptiles and Body Basics. Had a discussion about Living and Non Living things and completed a sort of various cards into the two categories. 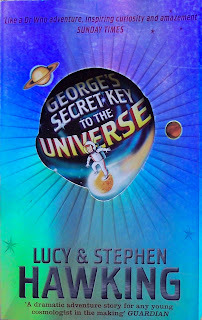 Our current chpater book read aloud is George's Key To The Universe (more on that later). 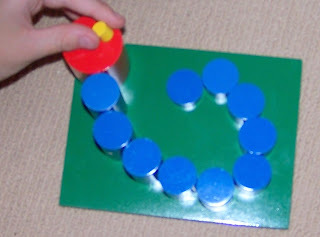 K is loving the knobless cylinders and has spent quite a bit of time with them this week. She also enjoys the knobbed cylinders and works with them several times a week also. 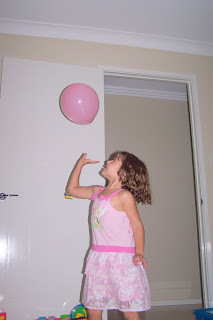 a spot of balloon volleyball whilst we were experiencing a power outage. Ok I know, I don't know where we have been living but before this week we had never visited the PBS Kids site, wow what a whole bunch of games they have. Consequently K spent quite a bit of tiem ont here this week. That brings me to the end of K's Preschool Corner. 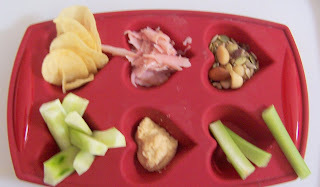 To see what other preschoolers have gotten up to this week check out Home School Creations. He graciously played along with Hi Ho Cherry O this week and I think really he even enjoyed it. He also played the Number Memory Game with us and I am going to make up a version for him as it is so simple, quick and fun. In his Targeting Maths he worked on Following Directions, Grids, Quarters, Calendar, Volume, Number Facts - Equivalence. We are also going back over his Addition Number Facts to make sure that they are rolling off his tongue. Although the most important part is to understand what he is doing I also believe that you still need to have a quick recall, so this week we went through the 5 Facts daily. He is powering along with his lessons in language this year. I think my choice to slow down last year and just let the first level of reading really sink in was a good one, for B at least anyway. He would have missed so much if we just moved ahead and steamed through the lessons (thank goodness we homeschool). He completed a full Fitzroy Lesson and an Explode The Code Lesson. I also went through a lesson at his level in the OPGTTR with him and although we won't do this daily (he does more than enough in this area) I will try and pull it out once a week just to review. I do like that it is completely oral and gives that extra bit of reading aloud practice. We have started to keep our first Book Journal. I saw this idea somewhere around the blogosphere but now have no idea where. The journal will go along with our reading of George's Secret Key To The Universe. For each chapter he completes a sketch and narrates something about that chapter which he then rewrites onto the page. I will post about this when we are finished I think. There is a fine line between the Book journal being enoyable and making it a chore. He is also doing History narrations this year and too be honest doesn't particularly enjoy them. I really want to continue though as I know it will help in so many areas. So this is the only narration work I will ask of him, history and to have 1 book journal happening at a time. Anything else he does will be of his own doing. B actually chose the Metal Insets this week, which was nice to see as he could still use a little help with his handwriting. 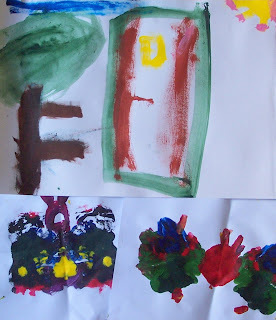 This weeks' home school network art class still had a focus on colour but also on proportion, shape, patterns and lines. He whipped up these little playdough numbers too. Oh he also did a painting on canvas, post to come. 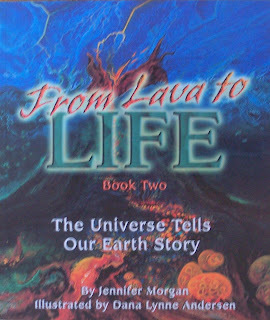 We progressed to the second book in the Universe Story Series this week, with the same grand plans as our last experience. Going in with grand plans I should of known we were doomed for failure! In fact we have only half finished this book and will try and get back to it this week. I have to admit that it was a lot to digest, all the talk about bacteria, DNA, Eukaryotes and Mitochondria., I think it was all a bit much and we have no narration at all. The remainder of the story introduces dinosaurs and birds so we'll see how we go with it. 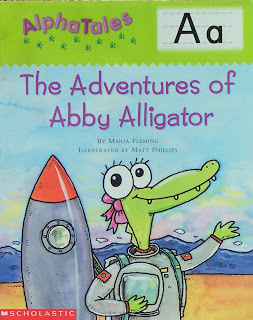 We read Percy The Peaceful Platypus, which I posted about here >>> Watched a couple of Magic School bus DVD's, Dinosaurs & Reptiles and Body Basics. Kez recommended this book to us and we have been enjoying it this week. (thanks Kez) I'll try to do a seperate review when we are finished. B is also really enjoying the knobless cylinders and also used the knobbed cylinders this week. He had his Mixed Sports class with the home school network with a focus on AFL Auskick this week. Also his Gymnastics lesson and playground play. Not forgetting loads of scooter riding as well. Plenty of Lego this week, I think he is currently working on some of the scenes from Star Wars. I'll try to remember to take some photo's this time. He also used PBS kids a little but he is really too old for most of what is on there. And that about wraps it up for our week. Phew! 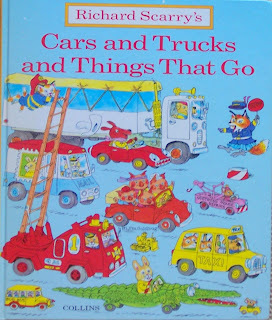 Cars Trucks and Things That Go, was my son's favorite book! I have been looking for it to read with Selena, I have always been a big fan of Richard Scary! You had a great week with all your kids! I love their art work! And you can see that they all had so much fun! I love Richard Scarry too! 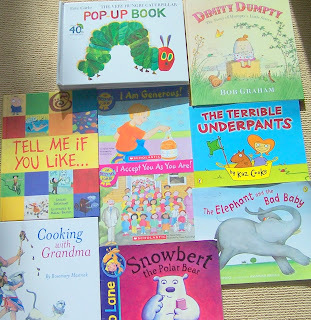 Great books. I'm glad you're enjoying George's Secret Key - it's a great book. What did B think of Auskick? Billy will be playing it for the 3rd season this year. 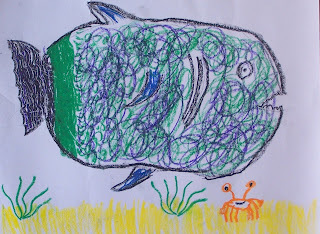 I really love to see the art work of your kids - it's awesome. You also read some good books. I am aware of this evolution book series and plan to use them too next year when Anna is closer to 5. And "Cars and Trucks" was one of her absolute favorites when she was about the age of C.
love the cherry fine motor activity! Don't just love when those little things to play w/ last so long! 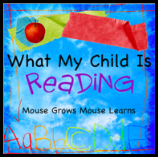 I really enjoy reading your blog because I love reading what all three of your little ones are doing. My daughter loves the dot painters too. She is just a couple of months older than your son, and at first she did the same thing as him....liked to paint her fingers. Now she is actually getting into dotting things.